Some days ago Red Hat has announced the availability of its Red Hat Enterprise Virtualization (RHEV) 3.0 public beta. The first beta of RHEV 3.0 was announced in August, but was not available to the general public. You needed to have an active RHEV subscription at that time. The evaluation is immediately available to anyone with a Red Hat Network account. Red Hat Enterprise Virtualization Manager is now a Java application running on JBoss Enterprise Application Platform on Red Hat Enterprise Linux. Was silly that first versions of this products required a Windows Server to run. A power user portal that provides end users with a self-service interface to provision virtual machines, define templates and administer their own environments. Extended multi-level administrative capabilities, allowing fine-grained resource control, Role Based Access control, delegation and hierarchical management. An integrated and embedded reporting engine allowing for analysis of historic usage trends and utilization reports. So the features of the Virtualization Manager are now similar of the core features of VMware vCenter Server (from the first releases). Transparant Huge Pages: New feature where the Linux kernel dynamically creates large memory pages (2MB -vs- 4KB) for virtual machines, improving performance by reducing the number of times that memory is accessed, typically improving performance for most workloads. This feature exist in ESXi from several versions. SELinux: because the KVM is a Linux kernel hypervisor, SELinux framework can be use to hardening the hypervisor. On the performance side, some benchmarks (Red Hat Enterprise Virtualization crushes the competition) try to demonstrate that the open source KVM hypervisor leads the industry in overall performance and scale-up as measured by the SPECvirt industry-standard virtualization benchmark. A few days ago appeared on the site VKernel an article that compares the current vSphere 5 with the next Hyper-V. The title is quite explanatory: Hyper-V 3.0: Closing the Gap With vSphere 5 . One wonders whether the article was prepared before or after the acquisition of Quest, but in the end it does not matter ... it is still an analysis of products that are not really omegenei, at least not from the point of view temporaire (the new version Microsoft Hyper-V is not released yet). When 3 Hyper-V will be released will talk about his upcoming confrontation with the vSphere. Ability to live migrate a VM that is the state of his records (in fact the equivalent of a VMotion + Storage VMotion). Live migrate VMs without shared storage. Networking completely revised with the possibility of third-party virtual switches (Already Implementing Partners Microsoft Hyper-V Virtual Switch 3 ). The storage medium of type NAS CIFS, SMB, NFS (also referred to can support nfs4). 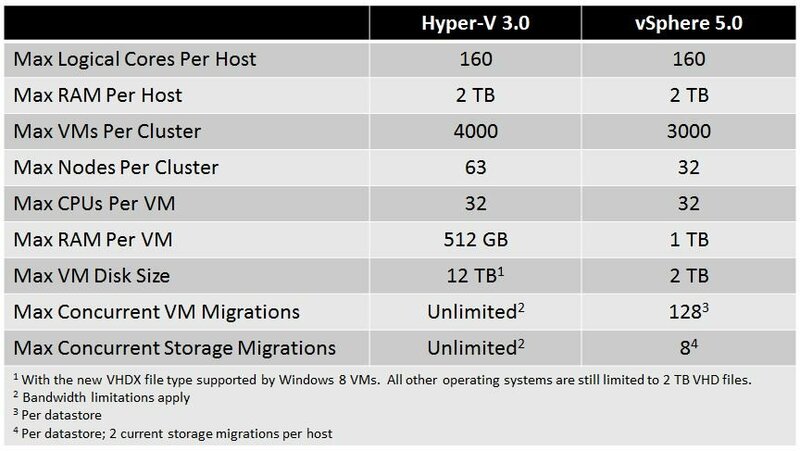 Since Hyper-V will also be available desktop side (but you have to do with what versions of Windows 8) could be some form of migration (almost certainly cold) even between desktops and servers. But basically Workstation 8 already does today. But perhaps the most interesting data, as also written in the article by VKernel, will be those related to performance: in August, VMware showed a performance study conducted by third parties , which showed that vSphere 5.0 was 20% faster than Hyper V-2.0. We must see the data between 3 and Hyper-V version of vSphere next year (likely date of issue of the new Windows family).